I got some fantastically beautiful heads of lettuce at the Farmer’s Market this past weekend. The heat has given farmers an abundance of lettuce and there were plenty of vendors offering great buys on what some were calling “heat wave lettuce”! I often have dinner with a friend who usually offers salad as part of the meal. She makes a dairy free dressing for me that is similar to ranch and her base is mayonnaise. I wanted to mimic this dressing to use for my lunch salads, but my goal was to find a more whole foods way to do it. I found this creamy alternative and while it did not turn out quite like I had hoped, it was a delicious flavor. The texture was more like a blue cheese than the smooth “buttermilk” ranch I thought it would be. I blame that on my blending option. I used a large blender for a small amount. When I try this recipe again, I will use my magic bullet instead. This makes about 1/2 cup of dressing. On Sunday I made a last minute plan to have a couple of friends over for “happy hour” so I used this dressing with a salad made of butter lettuce, red onions, thinly sliced Bartlett pears, dried currents and candied pecans. It turned out beautifully and received a thumbs up from my guests. I used the remainder of the dressing for my lunch salad yesterday, but I chose a more hearty salad that can withstand a little travel bouncing. I used butter lettuce, red onions, shredded carrots and zucchini, toasted almonds and some chili cilantro spiced chicken thigh pieces, cut bite sized. It was a delicious salad! I will definitely try this recipe again, adjusting my blending tool for the amount this makes. Give it a try! It’s a great alternative that provides a great whole foods protein punch! I made the most delicious sauce the other morning. It was a very spontaneous decision while I was trying to figure out what to pack for my lunch. I have been feeling great, getting solid sleep and have had TONS of energy in the morning. This, coupled with my habit of early rising has given me the opportunity to do things like spontaneous sauce making before heading off to work! I knew I wanted to use some quinoa noodles I’d purchased recently and greens from my dad’s garden I am still going through. I wanted a chilled salad since the weather has been horrendously hot here in P-town. I decided I would try something like a peanut sauce except using sunflower seed butter. I completely guessed on measurements and that caused a bit of a problem because the end result was a bit too salty for my liking, but still quite tasty. 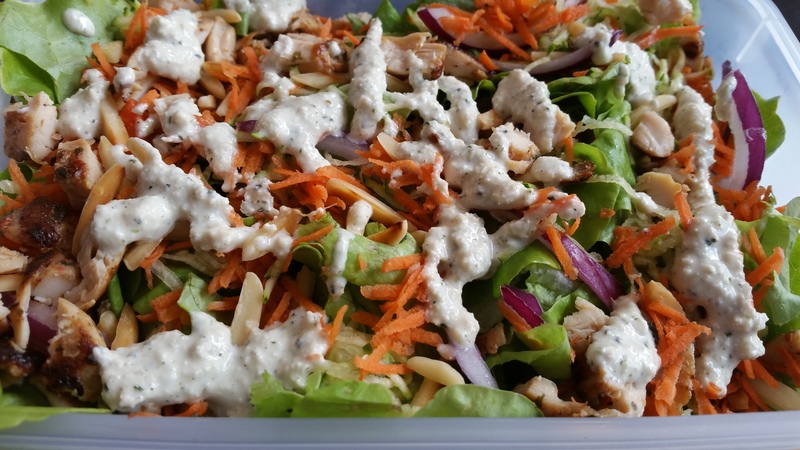 I got three days of noodle salad lunches from this dressing and that made me very happy! What wasn’t so happy for me was making this sauce landed me at urgent care! Yes, I am admitting to you all that I did one of the most ridiculously stupid things I have ever done. Why? I have no answer. Momentary brain freeze? I think so because when I was done blitzing my sauce with my immersion blender I proceeded to use my index finger to wipe around the inside blade area to get excess sauce off. I forgot to unplug the thing and accidentally pressed the button with my other hand while my finger was in the blade area. The result?? One very mangled index finger! Yeah, that one hurt like heck!! I am grateful my immersion blender is about 15 years old and while the blade is clearly sharp, it was not sharp enough that I lost my finger tip. I cringe thinking about what kind of damage a sharper blade could have done. The doctor I saw had quite a sense of humor and upon determining the condition of my finger, found my particular story rather funny. I agree. It is pretty laughable–now! I needed no stitches and I may not even lose my nail. I’ll just have to see how it heals. In the meantime, it’s gory to look at and I have one more great story to tell! I also still managed to get this lunch together! Thankfully, I had already prepped everything else before I bladed my finger!! I used quinoa linguine and cooked as the box directed then drained and rinsed them. 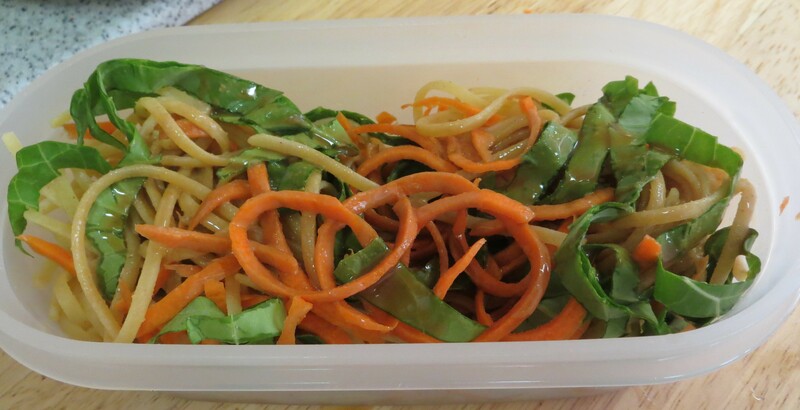 I spiralized one half of a medium carrot and cut one large collard leaf into thin strips then tossed the vegetables with the noodles. I drizzled the sauce on top and took it to go! 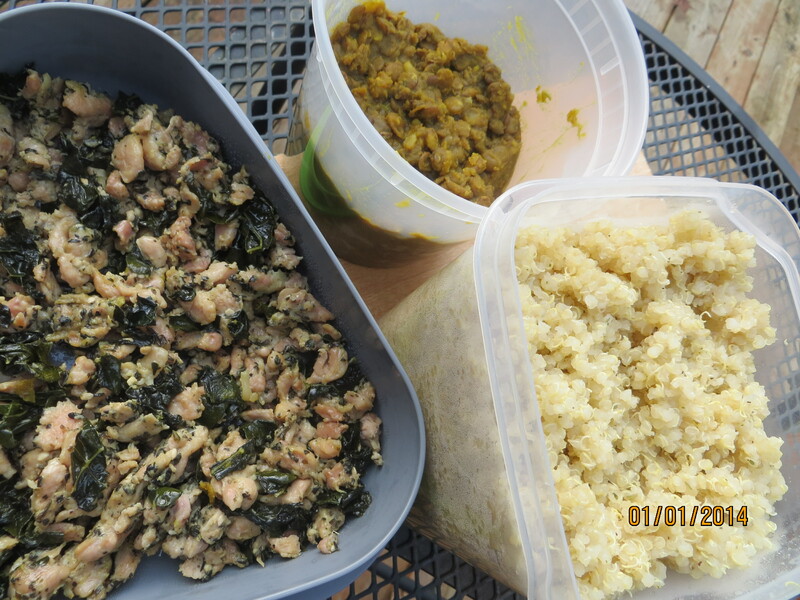 The flavors tasted phenomenal together after melding a few hours. I am roughly guessing the measurements on my ingredients and I think you could do the same. Make it according to your tastes and drizzle it on noodles or veggies or both! 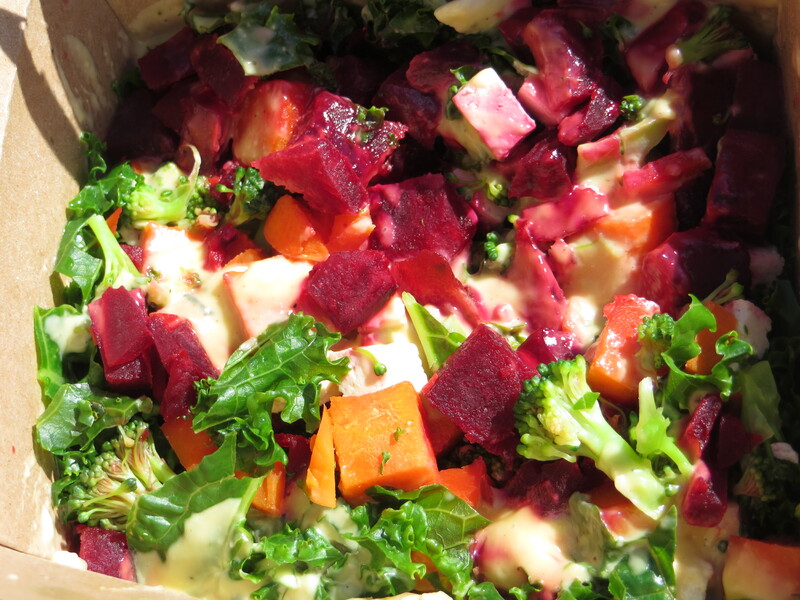 Enjoy a good summertime salad with the stupendous sunbutter sauce! And, keep your fingers out of blenders! Whisk or blend with an immersion blender until smooth and well combined. Store in fridg. Makes around a 1/2 cup of sauce. I recently returned from a whirlwind mini vacation to Boston where I spent time visiting my daughter and seeing as many sights as we could jam in to my short stay. It was so much fun!!! I love Boston and I especially love the T subway system. That transit system is fabulous, in my opinion! It allowed us to see all the amazing places my daughter had planned for me to experience. I enjoyed seeing nearly every neighborhood I wanted to meander, as well as a trip to the beach; all on the T!! The weather was gorgeous and I always have such a great time hanging out with my kid. We had casually talked about a trip to see her, but I didn’t think it was the right time to travel across the country considering my recent circumstances. It just felt too stressful. 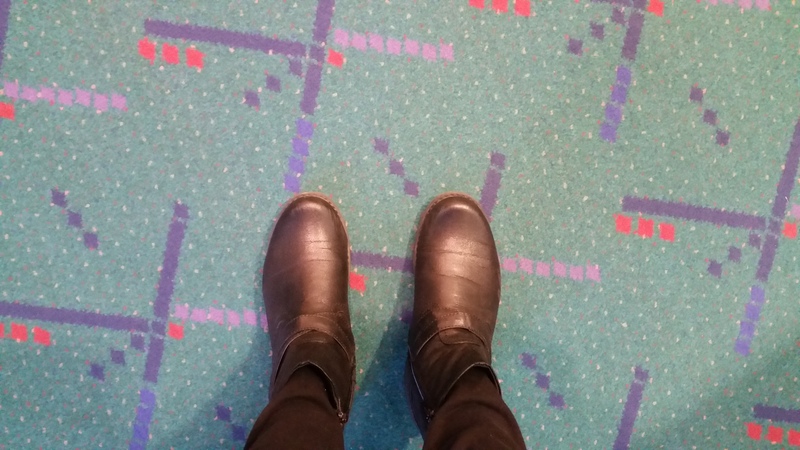 However, as things smoothed out for me and with now stable housing that would keep me in Portland, my daughter took the chance and booked the ticket. She wanted to give me a break from everyday life with all I have gone through and you know what? She was so right!! Being distracted in the best kind of way was exactly what I needed. I am so grateful to my girl, who has become quite an amazing young woman. She has an incredibly generous spirit and a big heart for her mama, which makes me feel so happy. Considering some tumultuous adolescent and young adult years, we have developed a close bond of mutual respect and admiration. I am deeply proud of the woman my daughter has become and I relish our time together. Knowing I wanted a good food experience during my stay, my daughter had a list of reviewed places that offered gluten free, dairy free dishes. We were regularly dashing off to various restaurants, cafes, bars and pubs to peruse their menus, always excited to try an impressive new dish. 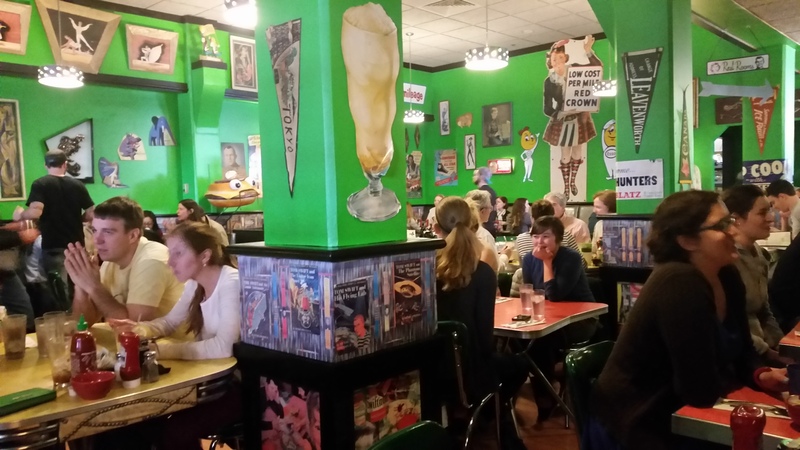 There are so many wonderful places to eat gluten free and dairy free in Boston. It certainly is not as prevalent as Portland, and there is a bit more planning involved to find the establishments that cater to my dietary preferences. Some of my favorite places to eat that offered the easiest menu for me or were willing to customize an order for me are worth a mention here. They are all on my “must visit” list each time I go to Boston. Besides offering my kind of food, generally the staff and overall environment of each of these businesses is an awesome in it’s own way. Thinking Cup deserved two visits. This trip I got to try out a new location in the Theater District. 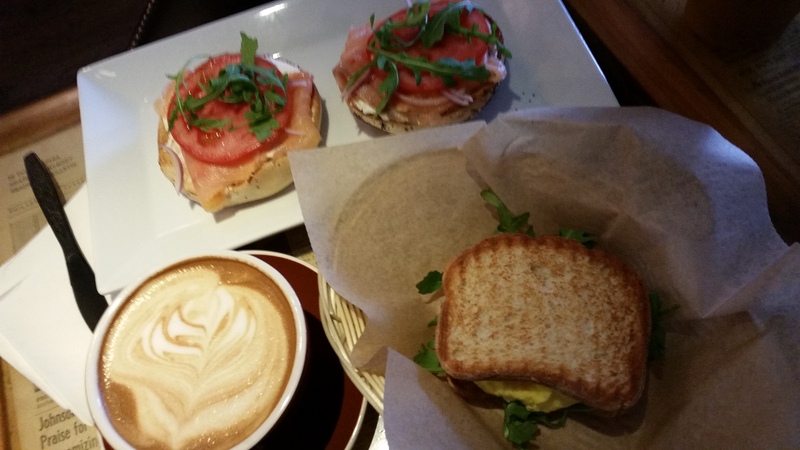 Both locations offered to customize my breakfast sandwich and both were equally amazing. I had smoked salmon with an egg on gluten free toast, one had arugula. 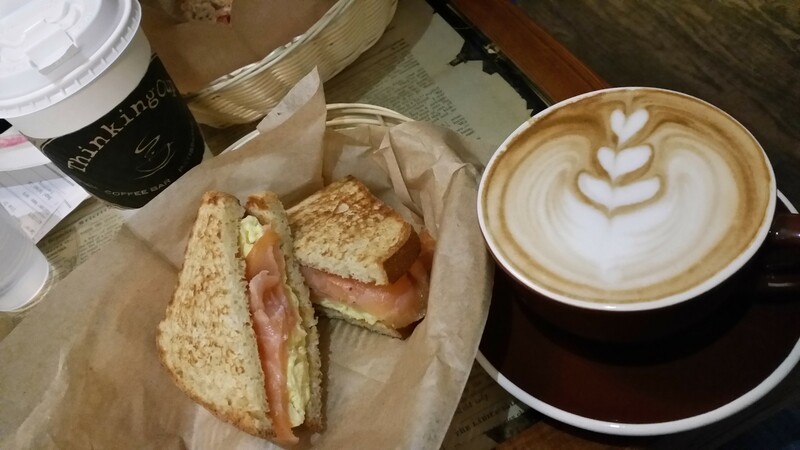 What really makes this a must visit place is their absolutely heavenly hazelnut lattes. They are the first shop in the Downtown Boston area to offer Portland originated Stumptown Coffee; my personal favorite. They make their own roasted hazelnut paste to use in these lattes and I have to say, it’s simply fantastic. Avana Sushi is a tiny hole in the wall place in Boston’s Chinatown. By appearance, it is one of those places that I would not consider without the high recommendation of someone who has already been there. 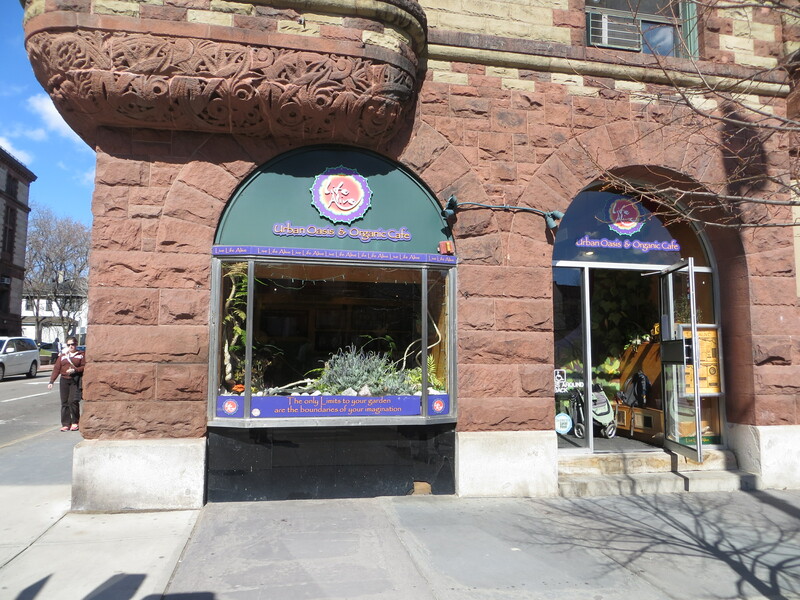 It sits in a tight corner of a space that is also occupied by other equally small, squeezed in businesses. There are just four tables and 5 counter stools. One of the tables sits at the edge of their kitchen. It’s an experience! I wouldn’t recommend this place to someone who experiences claustrophobia because this space is small! What they manage to prepare and plate is simply amazing. 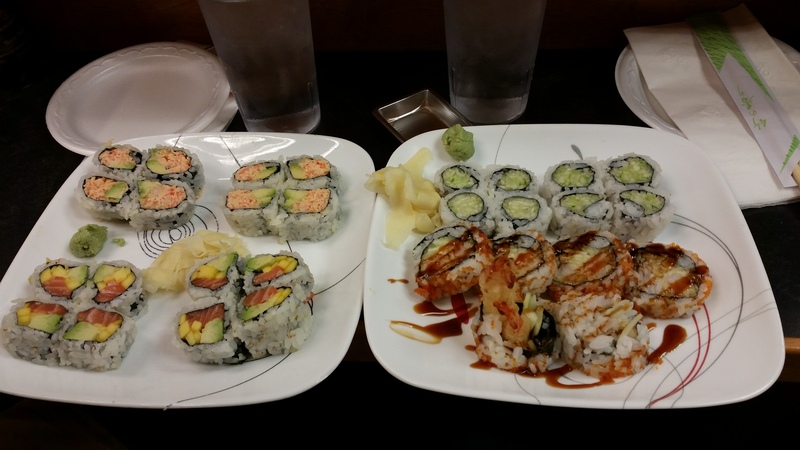 This is some delicious and fresh sushi for a fantastic price. The line that develops into the lobby and spills out onto the street is proof this place is worth a visit. 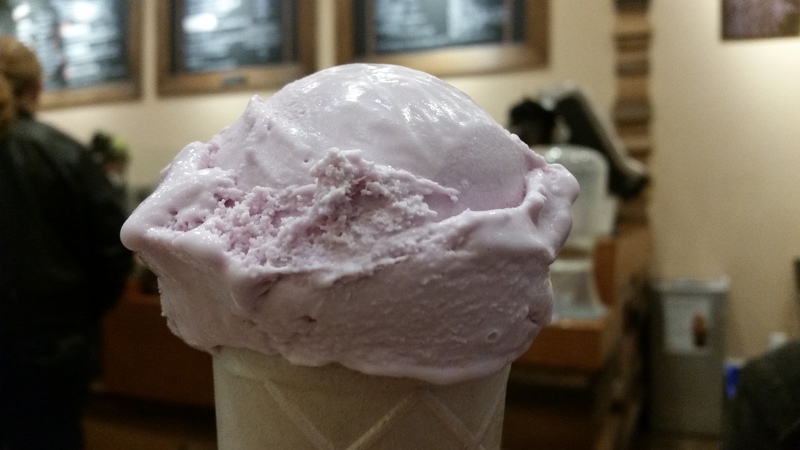 Sweet Lavender coconut based frozen dessert on top of a gluten free cone!! My first ever!!! Fomu (premium alternative ice cream) has totally got it right. This ice cream is d.i.v.i.n.e. !!! After my happy dance subsided about my first gluten free cone, my first taste of this creamy goodness made me stop walking because all my concentration had to be with my palate. Seriously, so good. Boston has one up on Portland, where there is no exclusive vegan ice cream shop. I fantasized a kick starter business for a while on this idea! We are missing out here in P-town. I will crave this delicious dessert until the next time I can satisfy it in Boston. This place is definitely worth a visit. Additionally, the staff are lovely to watch at their skill and will happily share their knowledge. It is a fun place that takes me right back to childhood ice cream memories!! This place is fantastic! It was my first visit to this place located in the Cambridge area. My daughter was really excited to take me here. Their menu boasts some unique and tantalizing dishes that are organic, therapeutic and nurturing for the body and soul. I wish I could remember the name of this delicious salad I had, but as you can see from the picture, it is filled with some whole food goodness. We enjoyed this lunch outdoors on a warm, sunny Boston day. It was a perfect afternoon! Other establishments worth mentioning is Ula Cafe in my daughter’s neighborhood of Jamaica Plain. Sadly, I have no pictures of the most incredible gluten free coconut macaroon I have ever tasted. We walked to this cafe’ for a morning cup of coffee and I discovered them in a display case while waiting in line. They were so moist and full of coconut flavor goodness. The edges were perfectly caramelized crispy and chewy. It was ridiculously good. When we walked back on my last day in Boston to get one more, we learned they were all gone. It was a specialty item for Passover. I am so glad I got to enjoy one before they disappeared! Fresh and colorful! 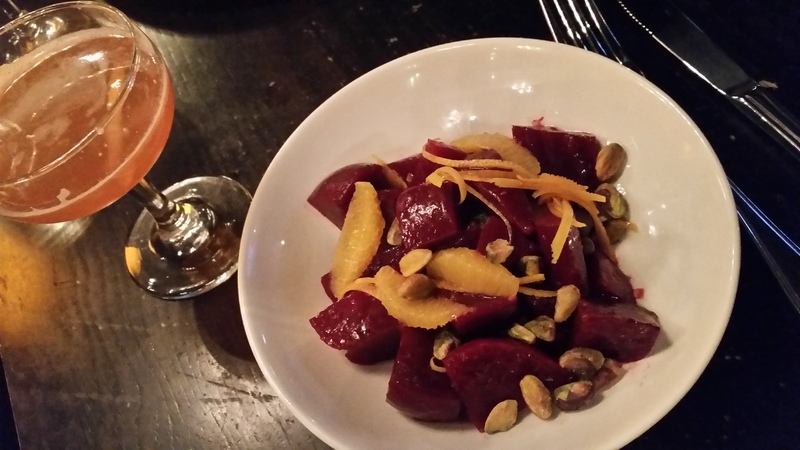 Canary Square offered a pretty amazing and tasty beet salad dish that was beautifully plated. 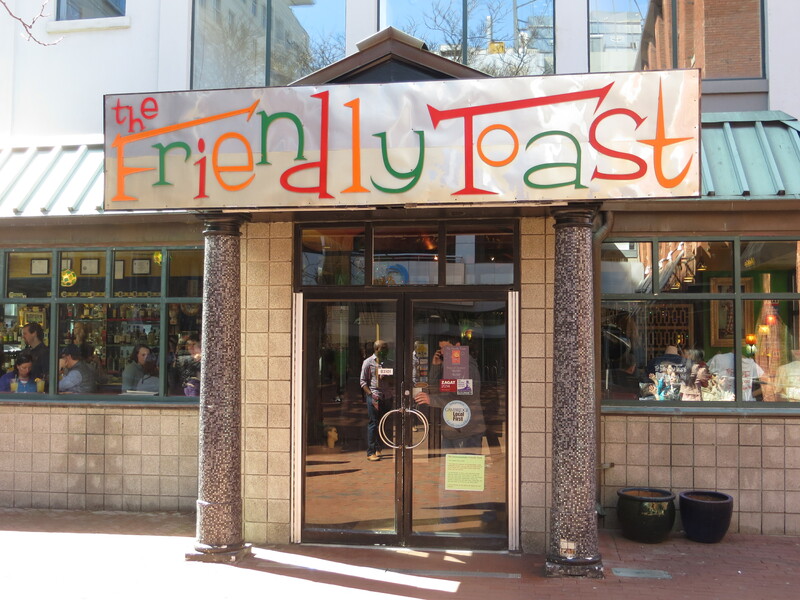 The Friendly Toast is worth the trip to the Cambridge area strictly for the eclectic experience you will have. People will wait for over an hour to enjoy dining here. They have huge portions of comfort classics and I must admit, their classic egg breakfast is pretty heavenly. My trip to Boston was outstanding. It was the break I needed. I came home with such a completely different perspective on my situation. I feel more solid in my future and I am a lot calmer; more accepting. My daughter and I both got exciting news while I was visiting. She will begin working at Brigham and Women’s Hospital, one of the leading research institutes in the country. My daughter will be working among some of the top scientists and I am so proud of her! My news is still developing, but I can definitely say it will be life changing! Stay tuned! Life is moving on and I am feeling good. Everything happens for a reason and I am finding mine moment by moment. Crazy how life works, isn’t it?? My sweetie and I are adventurers at heart. One of the many things we cherish together is our passion for new discoveries in the ordinary. Ordinary Oregon is a wide open palette of cleverly hidden gems intertwined through rural towns you’d never think to venture toward without a purpose. Some days we just want to get out of the city. Holidays, such as our recent President’s Day provided the opportunity to do just that. With a rough idea of our desired journey, our goal was to find a body of water and a forested area to meander and picnic. Oh, and to find the most commonplace small-time, local quick stop store where we could buy our Powerball ticket. It’s one of the fun things we do when we take day trip adventures. We like to believe one of those small nameless mini markets hold the winning piece of paper! It is silly fun. Our local weather is back to the usual rain. We saw plenty of it on our drive, including hail! We did get the pleasure of a few sun breaks that added to the charm of our day. We even saw the most perfect rainbow. By the time I grabbed my camera to get a picture, dark clouds covered it and it was gone. That was a beautiful rainbow. 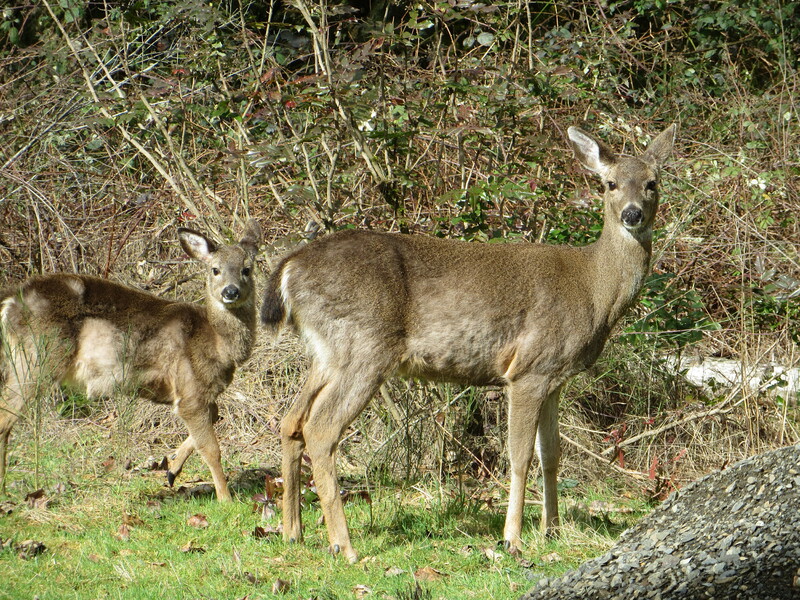 Moments later we rounded a bend to discover these beauties grazing in the shrubs. 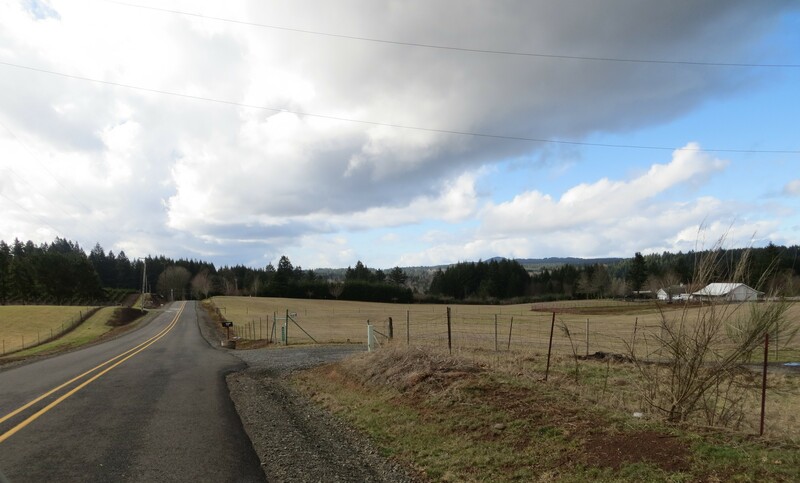 Filled with the wonder of nature, we continued on our day, cruising through small town Oregon, enjoying lush landscapes and sweeping farm land. 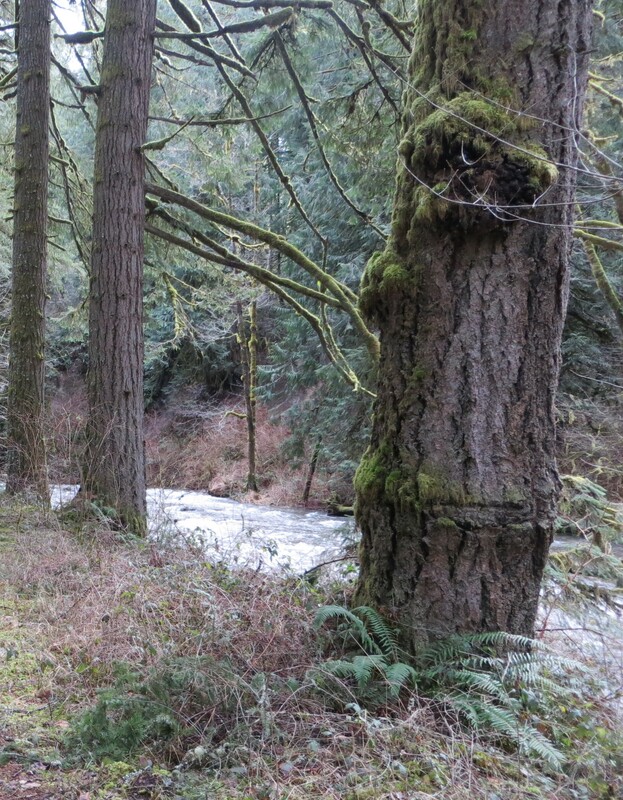 We found our body of water and our forested paths. 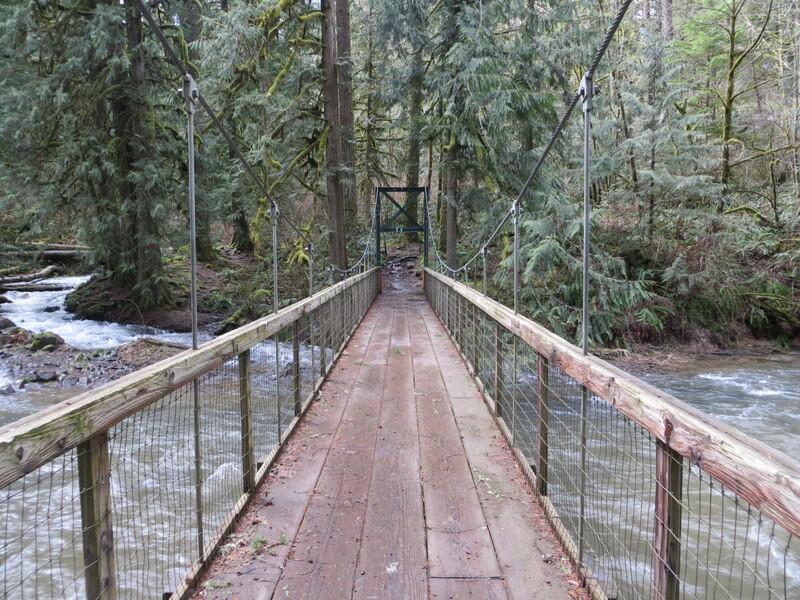 We saw covered bridges and broken down barns blanketed in moss and ivy. 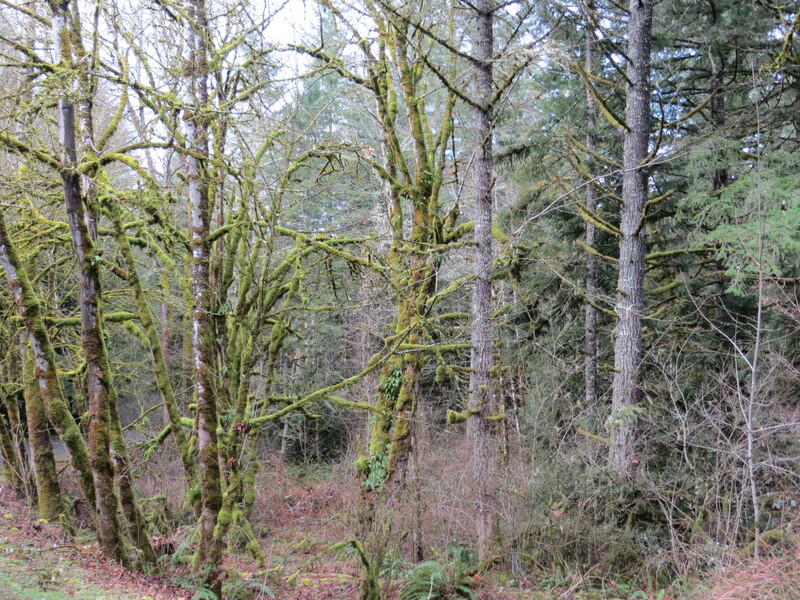 We discovered that there is still a lumber industry that appears to be thriving in Oregon. It gave us thoughts to ponder and created lively conversation. Did you know there is a Liberal, OR? We wondered if we were the only liberals around! We laughed. We enjoyed each other. We got lost in the succulent array of green that our state boasts and revived ourselves in our day of exploration. 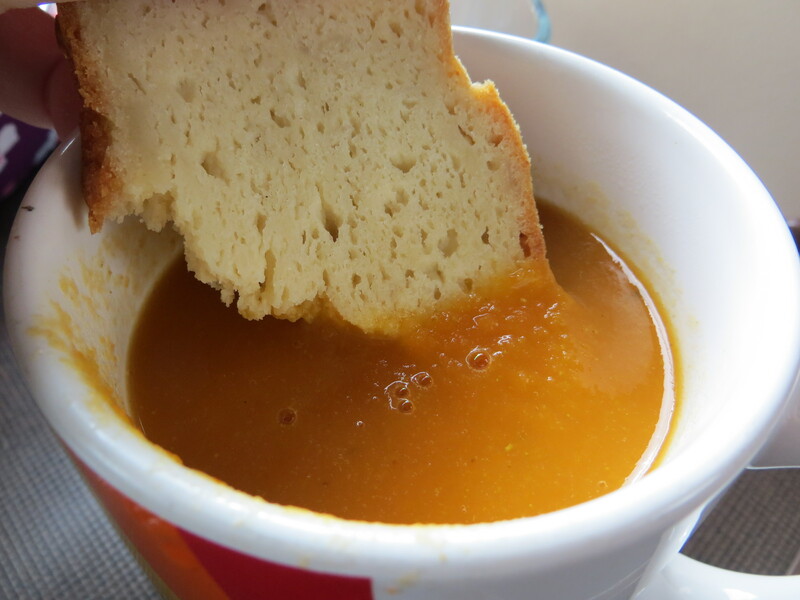 As we sat in our camper van with the clattering rain on our roof top, we also satisfied our hungry bellies and warmed our insides by enjoying a thermos of piping hot Carrot Soup with homemade gluten free bread. The food was outstanding and so was our day. Home and refreshed, I am ready for this week feeling relaxed and more connected with the world around me. I love our all around Oregon adventures. I am grateful too, for the time to feel connected with my sweetie in the midst of this frazzled, mixed up thing called life. My variation was using cumin powder instead of curry powder, I added a cup of chicken broth and a 1/2 cup of almond milk for a little creaminess. The bread was a surprising success!! I found this recipe in my folder recently. It was emailed to me by my son who was attending Johnson & Wales Culinary Institute in Charlotte, NC. He was taking a bread making class and had a few lessons on using alternative flours. 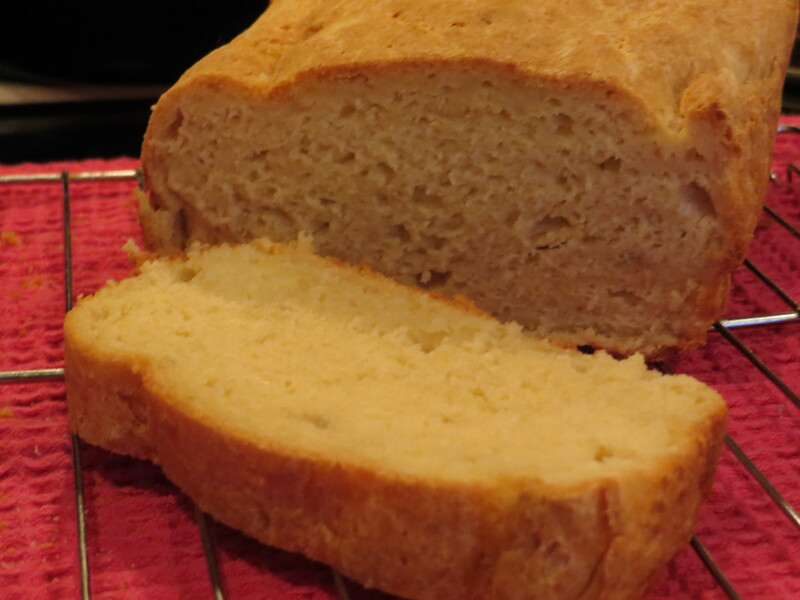 I rarely have a loaf of bread turn out this amazing. It tastes as good as it looks. The texture is fantastic and holds up well to toppings as well as dipping into soup! Enjoy this creation by following this recipe exactly. I found this to be the most successful way to have a beautiful loaf of bread. I cannot give proper credit to the author of this recipe other than to say it came from one of my sons classes! It is a delicious recipe. Preheat oven to 375 degrees. Remove plastic wrap and bake until golden brown, 45-50 minutes. 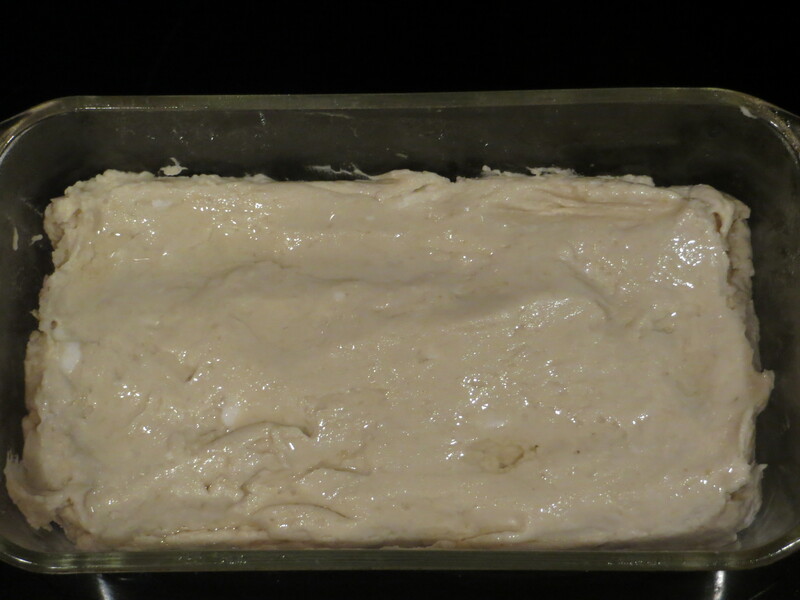 Remove from oven and cool on rack for 30 minutes before slicing. Freezes well. I am uncharacteristically low spirited these days. When those close to me ask me that same question, my response can be more honest. Really, most days I feel like I’m in a glass filled with murky water attempting to make sense of what I see around me. The world is moving so fast it makes my head spin and some days I want to simply stand in place as life rushes past in a feeble attempt to get my bearings. I search for simplicity so I can calm my mind and soothe my anxieties. One of my favorite things about making food is the single mindedness of the task. From preparation to the final result, there is one goal; to create something delicious. Through this process the storm of my thoughts become more tranquil and I begin to feel at peace. While I find thorough pleasure in my comfort food indulgences, I appreciate when I recognize my body’s signal that commands me to lighten up. I can enjoy tossing a few ingredients together in minutes just as much as poring over a complex recipe that takes time and precision. This lovely green smoothie serves multiple purposes. First off, it just tastes good. It is light in taste, made with a few simple ingredients and in just minutes I have a mason jar of healthy goodness to enjoy at the beginning of my day. Of course, the New Year always reminds us to refresh ourselves and create new goals. I get a secret happy feeling as I put ingredients together I know are good quality to help reset my body and make me feel restored. Imaginably, lightening my food intake and giving my body a refreshing cleanse will no doubt bring clarity to my mind and perhaps slow its spin cycle making way for anxiety to pass and allowing that lift in spirit I desire. So cheers to “clean” food. I know that more joyful days lie ahead. I’ll keep this smoothie recipe handy to boost my spirit, clear my mind and facilitate healthy healing. 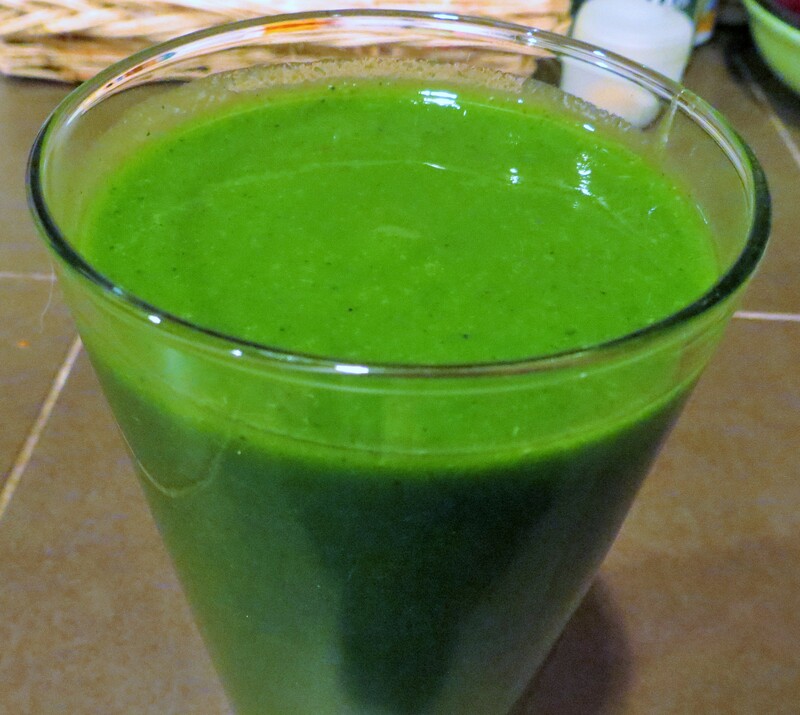 Add the spinach to the water in a blender, give it a few pulses until its smooth then add the remaining ingredients. Whirl away until its smooth. Pour into a container and refrigerate. Or, drink it right away!! Keeps in the fridg for about 3 days. This New Year is starting different, that’s for sure. What a strange/sad feeling I had when I realized I would not have that celebratory phone call to my mom just after midnight on the 1st as I had done for so many years. As I reflect on things past in 2013, it seems almost natural to express a formal intention to myself as I move forward into 2014. It’s been a good year overall; it just ended with a rattle and a bang, shocking me into next year! With this comes chaos in my mind. Some days its hard to be calm and find perspective. I tell myself to relax! When life’s forces pull me in and push me around, my best tool of survival is the kitchen. My common anxiety cure lies somewhere between vegetable chopping and the deep curry aroma of my simmering lentils. What emerges are not only dishes to satisfy the belly, but I find peace of mind. In the fluffing of quinoa and the whisking of what would become honey mustard dressing, I found that moment of surrender, a willingness to embrace the moment, letting go of the things I cannot control and finding acceptance. My intention for 2014 is to appreciate life’s moments, be accepting and make happiness along the way. When I get a little knocked around, and we all do, I’ll nest in the kitchen for some culinary reprieve. These delicious dishes I created are sure to make some happy moments in our household! Now, that’s good “therapy”! Happy New Year to you all! May 2014 bring health to your body and peace to your mind. Eat well.